In our commitment to help you get the best products for your skin type, we’ve come up with this list of the best humidifiers for eczema chosen from over 15 different brands. The products were selected based on their ability to soothe the uncomfortable effects of eczema without burning holes in your wallet. 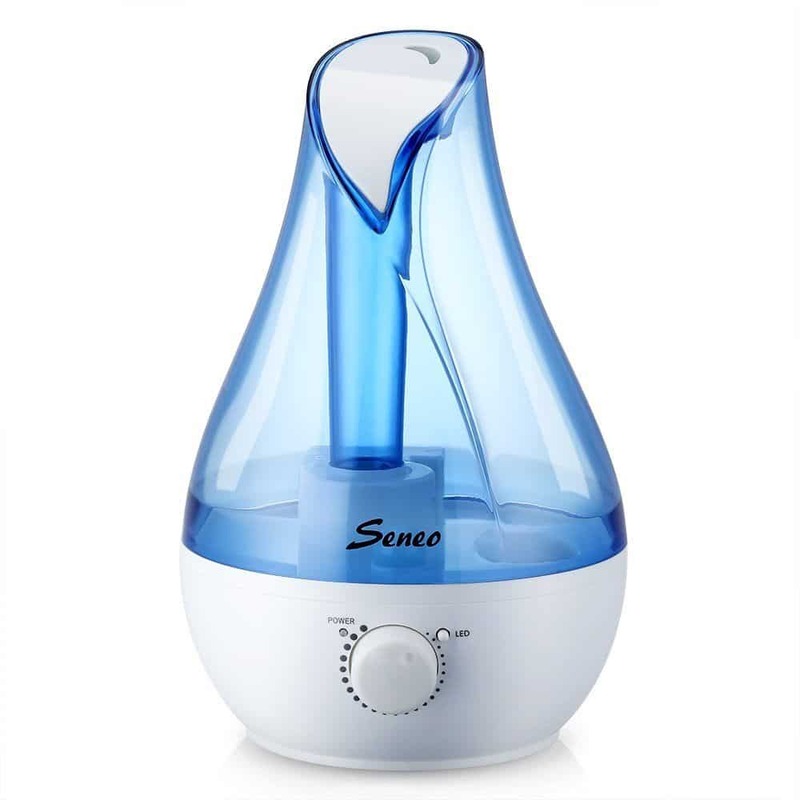 The Seneo Cool Mist Ultrasonic Humidifier is a great humidifier to have at home if you are looking for a device that can give you a lot of control. It features 24-speed settings and 7 changing LED bulbs to ensure your comfort and relaxation. Featuring UV technology, Honeywell Germ Free Cool Mist Humidifier , promises to kill 99.9% of the bacteria, viruses and molds in your room. It's a bit bulky but claims to be 25% quieter than other humidifiers. Air-O-Swiss AOS 7147 Ultrasonic Humidifier can diffuse both warm and cool mist. It's perfect for both home and office use as well as for rooms that measure not more than 600 square feet. Crane Drop Shape Ultrasonic Cool Mist Humidifier has a fun design and comes with several color choices. It features a 360-degree nozzle output to give out more mist for your room. Confused by your choices? Read on to find out which of them you should try out. The Seneo Cool Mist Ultrasonic Humidifier can produce around 380 ml of moisture per hour. It comes with 24 different speed settings so you’ll have more control over its moisture output. And if it runs out of water, it will automatically shut down for safety as well as energy efficiency. You’ll no longer have to worry about the humidifier running empty at night. Another feature that I really like about this humidifier is that it can also act as a night light. It has LED lights that change color to help you sleep and relax better. It doesn’t make a lot of noise, too. One downside you might encounter with this humidifier is that it can be a bit difficult to clean but it won’t take a lot of work. It also features an essential oil tray at the back but that doesn’t make this product a great oil diffuser. Honeywell Germ Free Cool Mist Humidifier can kill up to 99.9% of bacteria, molds and even viruses. Aside from this feature, you’ll also love that it’s almost 25% quieter than most humidifiers. If you place it on low setting, you’ll be able to enjoy its benefits for around 24 hours. It comes with 3-speed adjustment settings for both sound and moisture. In case you are feeling a bit lazy to manually do the adjustments, then you’ll enjoy this device’s Self Regulating Evaporative System. The humidifier is a bit bulky. However, despite its size, it can only effectively work in medium sized rooms. Its design is impressive, too. Although it’s a bit bigger than the others, it’s not that hard to clean or even fill. Its base is flat so you won’t have a hard time filling it on your sink. If you purchase this humidifier, I suggest you set aside some extra cash for filter replacements. Its filter is antimicrobial treated and you need to replace it regularly to ensure that the device can get the job done. Air-O-Swiss AOS 7147 Ultrasonic Humidifier features an optional cool and warm mist. It has a digital display and promises to be whisper quiet when used. You can use it in the office or in one of the rooms in your home. As for space, it can cover up to 600 square feet. The nice thing about this humidifier- which I’m sure you’ll like- is its two nozzles. Instead of delivering mist in one direction, it can distribute mist in two directions which means you’ll get better air in your entire room. The Air-O-Swiss also comes with an indicator that’ll let you know when its water is reaching low. Aside from this, the device also comes with a multifunction display to remind you when it’s time to change filters or when you need to clean it. It also has sleep mode and timer function. Well, not everything about this unit is great. Although it does have a sleek and compact design, the actual device isn’t that sturdy as it’s prone to leaking. It doesn’t come cheap, too. If you are looking for a humidifier that won’t look awkward in your room, I’d have to say that the Crane Drop Shape Ultrasonic Cool Mist Humidifier is a good option. Aside from its fun design, it also comes in a variety of colors. It has a 360-degree output nozzle to effectively cover rooms measuring 250 square feet. The nice thing about this humidifier is that it comes with an opaque tank so you can easily see how much water it has. If you missed refilling its 1-gallon tank on time, the device will automatically shut down. Despite not needing filters, this cool mist humidifier can still kill up to 99.96% of bacteria. It claims to be an effective home remedy for nasal congestion, dry cough as well as eczema. Safety 1st Ultrasonic 360 Humidifier can provide moisture rich air whether you place it in your baby’s nursery or any other room at home. It comes with two 360-degree rotating mist outlets to give you better control of the humidifier. It’s a perfect feature to have for a humidifier, especially if you have a big room or if you have more than one kid sleeping in one room. The nice thing about this device is that it doesn’t require filters which mean you won’t have to spend additional cash buying replacements. It also cuts down the risk of having bacteria growing inside your humidifier. There’s also a light in front of the humidifier that’ll alert you when it’s time to refill the tank. In case you missed it, the device will automatically shut down to save energy. Eczema has always been closely related to how well a person’s skin is hydrated. If it’s dry, the skin gets irritated and cracks up more easily. In the simplest term: the drier your skin gets, the more prone you are to eczema. This is where exactly humidifiers play a major role. What these devices do is add water to the atmosphere to make it less drying for your skin. You know those mornings where you wake up suddenly seeing more red and inflamed skin? Humidifiers can also help you with that since the moisture they provide can help cut down the itch, especially at night. Another benefit of humidifiers on eczema skin is that they help keep your eczema creams and ointments last longer on your skin. They can also help you get relief from the discomforts that come with the condition. With tons of humidifiers to choose from, picking the best humidifier for eczema can seem like a daunting task. Aside from features, you also have to consider the capacity, the noise they create as well as the way they release mists. All of these features I mentioned are only minor details you don’t have to worry too much about. For eczema, the most important thing to consider is the type of mist a humidifier releases. Because eczema skin needs moisture, the best humidifier you can get is one that releases cool mist. This type of humidifier won’t cause any drastic change in the temperature of the air which means it has less chances of irritating and drying out your skin. Another thing you have to be cautious about is adding essential oils to your humidifier. Although there are oils that can soothe eczema skin, you also have to keep in mind your skin’s sensitivity. I suggest you start out real slow if you’re planning to use essential oils. Test it for a few days and see how your skin will react. If you see any signs of irritation, discontinue it right away. Humidifiers need to be cleaned regularly since they can also harbor harmful microorganisms. If your humidifier uses a filter, change it as necessary or as directed to prevent molds from growing on it. In case your humidifier doesn’t require filters, make sure to wash the water reservoir frequently. Humidifiers are a great help for eczema skin for the hydration and comfort they provide. For this roundup, we’re selecting the Seneo Cool Mist Ultrasonic Humidifie﻿r as the best humidifier for eczema 2017. The device has 24-speed settings to give you more control and changing LED lights to provide relaxation. Despite its long list of nice features, this humidifier is affordable and comes with an ultra-high capacity you’ll enjoy.